Monitoring our resources is essential for having a healthy PC. Knowing peaks of our computers’ abilities can sometimes be a lifesaver, and will prevent us from overloading, and overheating it. But there are so many factors in our computers that need to be monitored. Some of these factors are CPU load, clock speed and temperatures, fan speeds, voltages, RAM usage and more. If we know our CPU’s current temperature, we can prevent it from potential overheating. Therefore, we can be sure that our computer is functioning normally, even during the hottest days. In this article, specifically, we’re going to talk about CPU temperature measurers. If we know our CPU’s current temperature, we can prevent it from potential overheating. Therefore, we can be sure that our computer is functioning normally, even during the hottest days. All in all, knowing these details is crucial, but it’s hard to keep track of so many information. Well, it doesn’t have to be that hard at all, because we know a couple of useful programs that will provide you with any info about your computer’s behavior. So, check out our list of the best software for monitoring your hardware for Windows, and you won’t have to worry if your computer will explode on a hot day. What is the best software for monitoring CPU and hardware temperature? Can you set your CPU speed in it? Does it show internal voltages? Can it monitor the temperature of all cores? 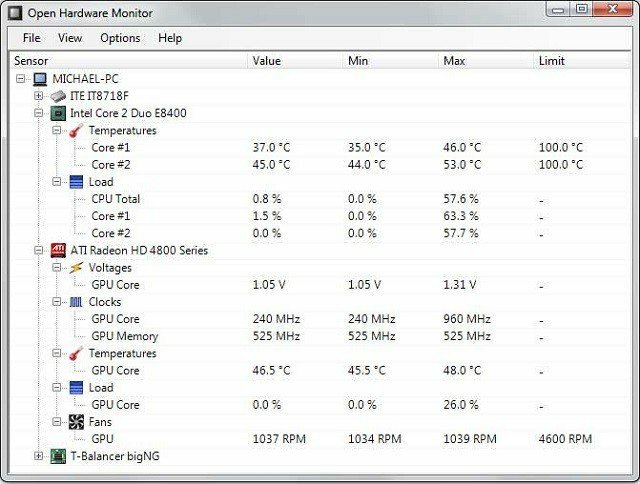 Does a monitoring software display GPU temperature? Can you customize processor’s max/min speed? Is it possible to set an automatic shutdown in case of overheating? Does a hardware monitor come in a portable version? Let’s choose a tool for you! AIDA64 Extreme is a comprehensive system analyzer and benchmark tool which including some powerful features as CPU monitoring. Besides that, you can also have a look at your RAM and GPU performance and possible spikes&issues. Its interface is very intuitive and similar to Microsoft Console Management. You can consult a large number of activity indicators. This software also allows you to stress test all your components in a large variety of combinations. Speccy is a great tool that scans and shows all your computer’s hardware. It will show your processor’s brand and model and also its performance. Through many indicators, you will also find your CPU’s temperature. This is very helpful if you need to keep an eye on its heating state. The users are very satisfied with Speccy as it is perfectly compatible with Windows 7, 8/8.1 and 10 versions and it does not waste your system resources while running. Another notorious feature is that Speccy provides you the temperature information about other PC components. HWMonitor is a simple software for displaying your components’ performance. It shows stats like your system’s temperatures, fan speeds, and voltages. This software is developed by CPUID, a developer of CPU-Z and PC Wizard, so we can say it has pedigree. The best thing about HWMonitor is its simplicity. The program lists all results on a single window, divided into layouts. Similarly to the Device Manager in Windows. You can see your motherboard’s temperatures and voltages, processor’s temperatures and voltages, and your GPU’s temperatures and voltages. Three sets of values are displayed – the current value, the minimum value, and the maximum value. 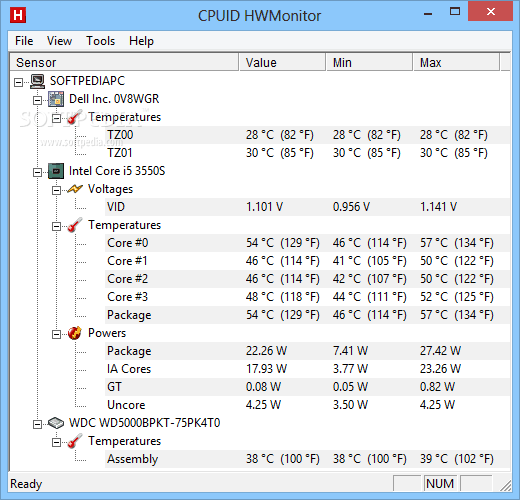 If you just need to quickly check your computer’s temperature, HWMonitor is probably the best solution. However, it doesn’t have some more advanced features, like the ability to save monitoring or SMBus data to a text file, or the ability to control fan speeds or setting warning alarms. HWMonitor is available for free, and you can grab it from this link. 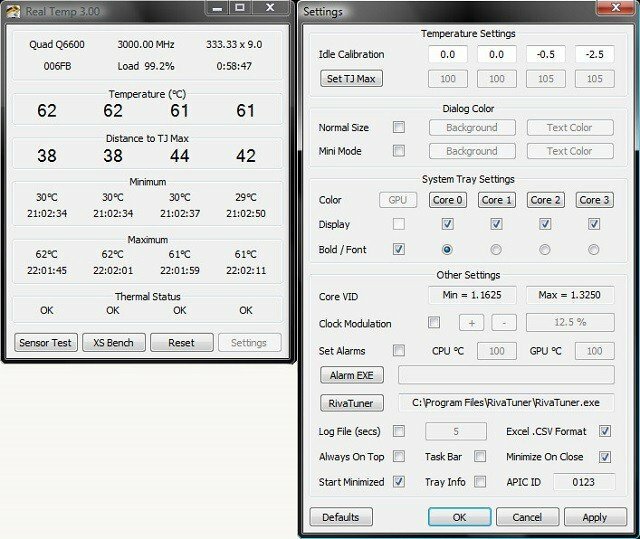 Real Temp is a free software specialized for measuring temperatures of Intel’s processors. 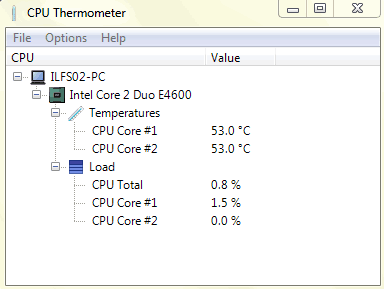 So, if your computer is powered by an Intel processor, Real Temp is the great solution. If you’re using some other processor, keep reading this article for other options. Real Temp is compatible with single core, dual core, quad core, i5, and i7 Intel processors. It shows the temperature of the CPU in real time, so you can spend some time to monitor the temperature change, if you want. Besides showing the current temperature in real time, Real Temp also shows minimum and maximum temperatures of your processor, since you turned on your computer. The program allows you to set up an alarm for high temperature, which eliminates the risk of overheating. Real Temp is a portable program, and you don’t need to install it, just run it, and start monitoring your CPU’s behavior. You can download Real Temp for free from this link. If you don’t want to mess with third-party programs, you can always seek help from Windows’ own Task Manager. We suppose you’re already familiar with this tool, but just in case, let’s remind us of what Windows Task Manager can do. 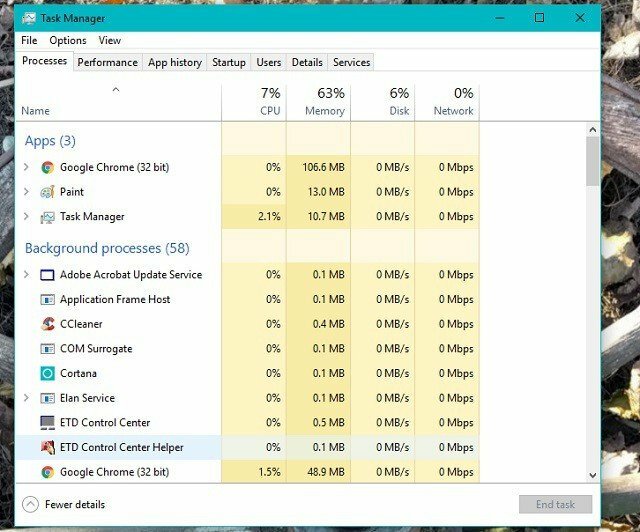 Task Manager keeps track of all running processes in your computer. It shows you how much each process uses CPU and memory. Of course, you can close any running process to free up some memory, this is particularly useful in case of memory leaks. There are also some more advanced features, like the overall usage of your CPU and RAM, and info about these components. It doesn’t measure temperatures, but if you just want to check which program or service uses the most memory, Windows Task Manager does just fine. To open the Task Manager, right-click on the taskbar, and select Task Manger, or press CTRL+Shift+ESC on your keyboard. Rainmeter is different than any other software on this list. Simply because it is not a standard program for measuring system’s performance, but a free utility for customizing your desktop. 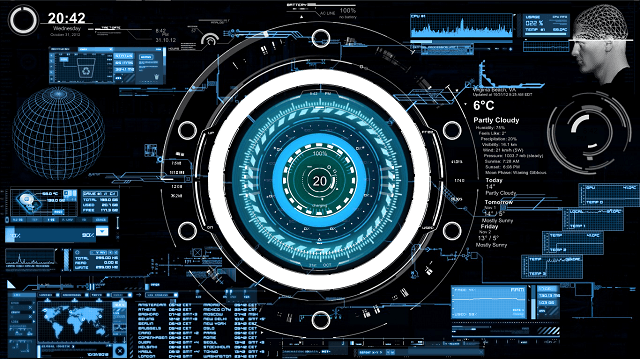 Rainmeter works similarly to Gadgets, except it features way more options. You can find skins in various places, but the most common are DeviantArt, Customize.org, and the Rainmeter subreddit. When you download a skin (.rmskin file), just double-click it to install and enable it. As skins contain multiple features, you can even choose which feature you want to be displayed on your desktop. Open Hardware Monitor is another extremely simple program for monitoring your hardware’s performance. It offers a similar, easy-to-use user interface as HWMonitor, but with some extra features. All components are shown in a single window, sorted in a Device Manager-like style. Besides easy navigation, Open Hardware Monitor shows CPU / GPU frequencies and load, memory information, hard drive storage space and even some extra info about your SSD. Additionally, there’s a plot graph for all available temperatures. Open Hardware also offers some customization options, like the ability to rename or hide each value, or adjust the offset. Open Hardware Monitor is a portable software, so you don’t need to install it. Just download, and run it, but make sure you run it as Administrator to ‘unlock’ all available features. If you want to download Open Hardware Monitor, you can do so from this link. 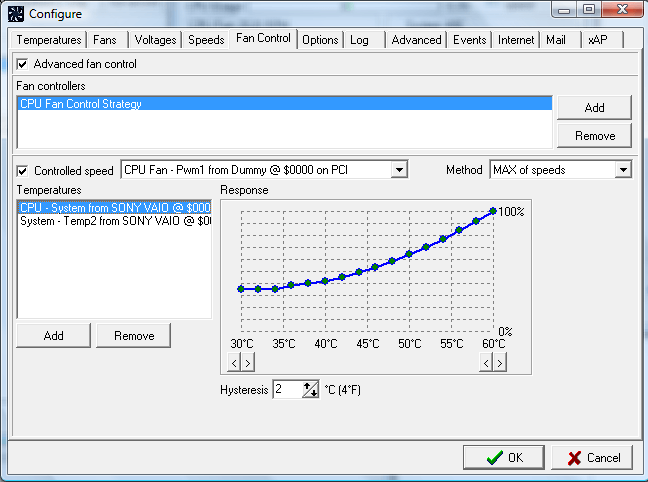 Speedfan is arguably the most famous program for monitoring temperatures. It has been around for quite some time, and it’s even older than Windows XP! But despite its age, Speedfan is still a very reliable tool for measuring almost any temperature in your PC. Besides the ability to monitor CPU temperature, fan speed, and voltage, you can also control the fan speed, in case it runs slow or noisy. You can also set up a warning if a temperature is high, or initiate an action that will send an email or run a program. There’s also a graph available, in case you want to make a deeper analysis of temperatures, or voltages. Speedfan is relatively easy to use, however, it requires some time to get set up, but that shouldn’t be a major problem. So, if you like trustworthy stuff, Speedfan is definitely a great software to try and use. You can download Speedfan for free from this link. As its name says, Core Temp is a software for measuring the temperature of core values from your CPU. However, the program provides extremely accurate results, so if you’re looking specifically for this piece of information, you should definitely consider trying Core Temp. There are also some useful options for preventing overheating of your computer. You can set up a notification, or program your computer to shut down or go to sleep, when the temperature is too high. Those with ‘better’ keyboards will also be able to receive notifications from Core Temp on their keyboard display. If you want to download Core Temp, you can do so from this link. CPU Thermometer is a minimalistic program for measuring your CPU temperature. 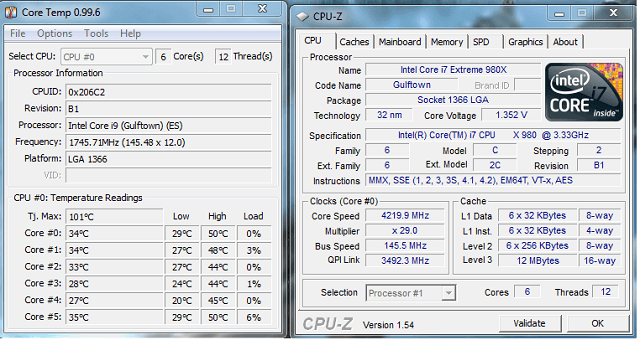 The program is extremely easy to use, as it only shows CPU temperature and current CPU load of each core. 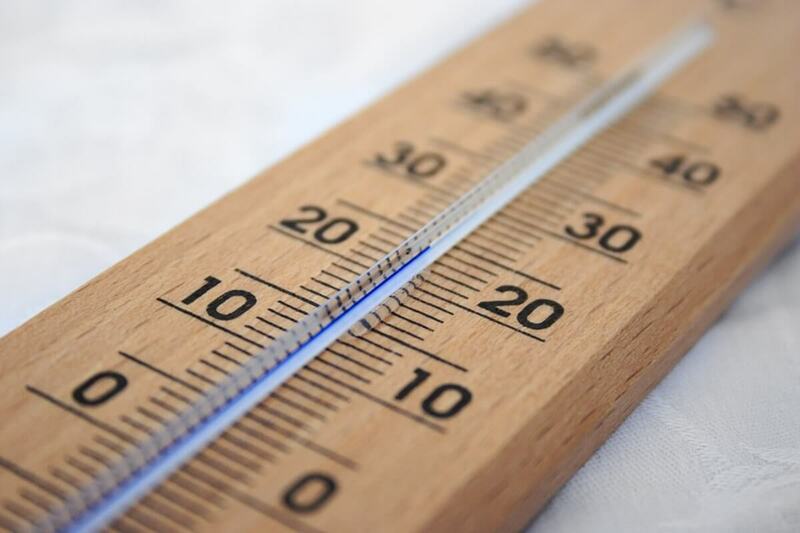 Due to its simplicity, CPU Thermometer lacks advanced features. In fact, the only customization option you have is the ability to change value metrics between Celsius and Fahrenheit. CPU Thermometer shows your current temperature as a tray icon in the taskbar, which is good, if you don’t want to deal with any extra windows. As we said, this program is extremely simple and basic, and it’s for users who don’t want to do any deep analysis, but simply check their CPU temperature. CPU Thermometer is available for free, and you can grab it from this link. 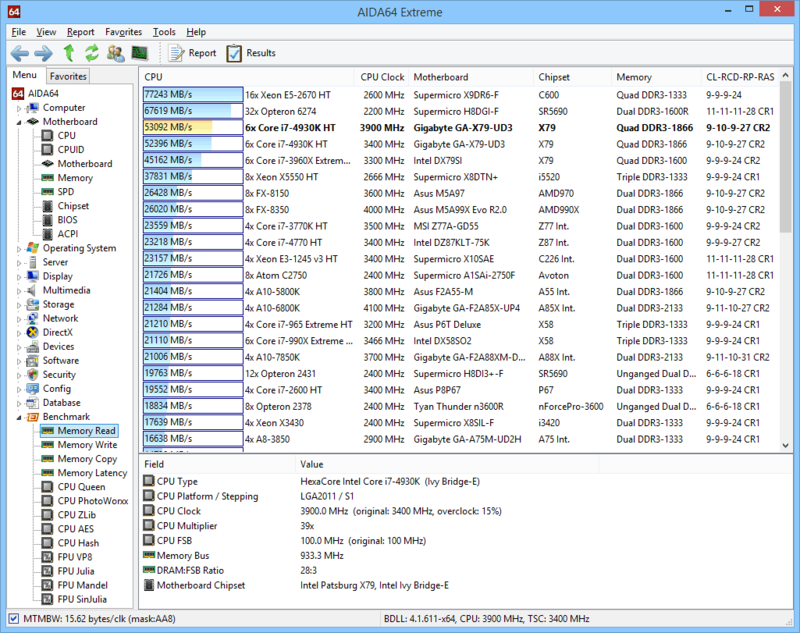 This concludes our list of the best hardware performance monitoring software for Windows 10. These tools offer basically anything you need to keep track of your CPUs temperature, voltage, and more, so you can choose the right program, according to your needs. Do you agree with our list? Or you know about some other awesome monitoring program? Let us know in the comments. Editor’s Note: This post was originally published in November 2016 and has been since revamped and updated with new products so our users would have a wider range of alternatives. We want to be sure that our list has the best products that will fit your needs.